My sister came back from her European travels last weekend. The whole family (my mom and dad) + Mark celebrated her return at my house. We pretty much cooked the entire weekend oh! and finished building the fence, big whoop! It went down like this: my dad, Mark and I would place pickets, level, then attach them. My mom was in charge of making sure everything was straight, while keeping the beer and wine flowing. And my sister shared her travel adventure stories with us – she met a boy(!!!) in Scotland and he’s coming to visit her next month! It sounds kinda serious and super sweet. I don’t know a lot about him yet but he doesn’t eat any gluten or dairy (except goat cheese) and no refined sugar. So now my mom’s worried that between him and Mark (being vegetarian) there will be nothing left to eat! I told her not to freak, we may have to get a little creative when we all get together but we definitely won’t be going hungry. Around that time Gina from Bosky Acres Farm pulled up to the house! Bosky Acres is a local (Charlotte area) dairy goat farm. I was so excited to try their cheese and so was everyone else, good thing Gina brought enough samples to go around! I came up with this recipe on the fly that day – inspired mainly by this delicious cheese and what was in the fridge. 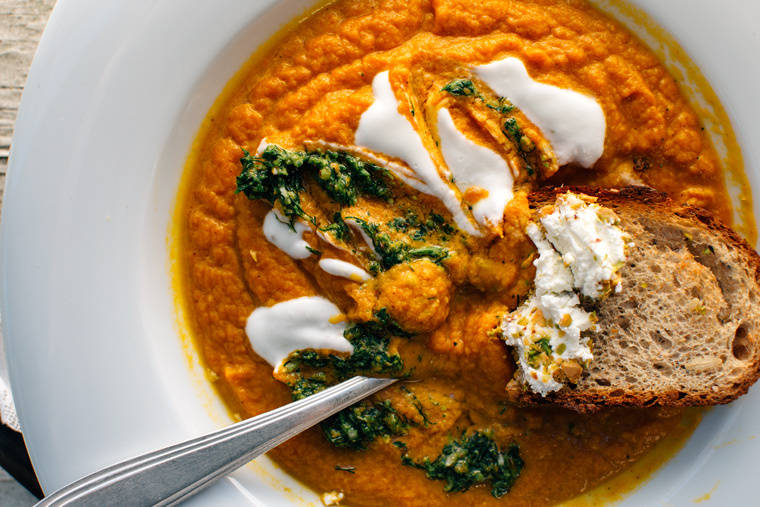 This soup also just so happens to be gluten free, dairy free (except the goat cheese of course) and vegetarian, maybe I’ll make it again when Robin comes to visit! Wash and dry the greens and place all ingredients except the oil into the food processor and blend. 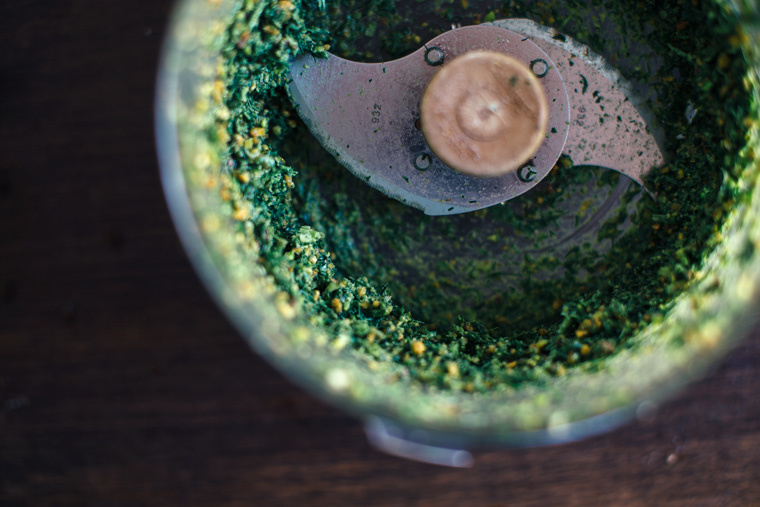 I find that if you add the oil after you process the herbs, nuts, etc you have a much nicer pesto consistency and flavor – less clumping + greater oil control. Sauté a small onion and one celery rib in a bit of butter, earth balance or olive oil until tender and fragrant, add a few pinches of salt and some fresh pepper. Next, add the roasted carrots and veggie stock. Cover and let simmer 10 minutes or so or until carrots are really tender. Emulsify soup with you emersion blender or transfer to high-speed blender. To make the goat cheese cream just mix the ingredients together adding more or less kefir for desired consistency. 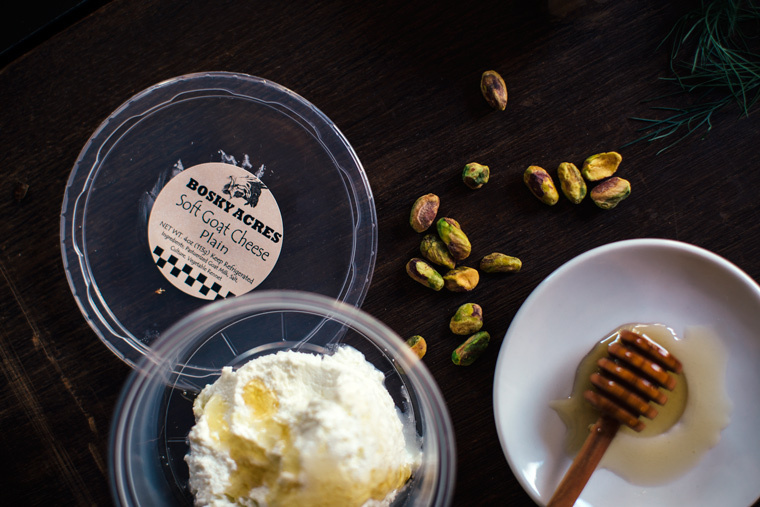 For the goat cheese truffles – mix goat cheese and honey together with a spoon. 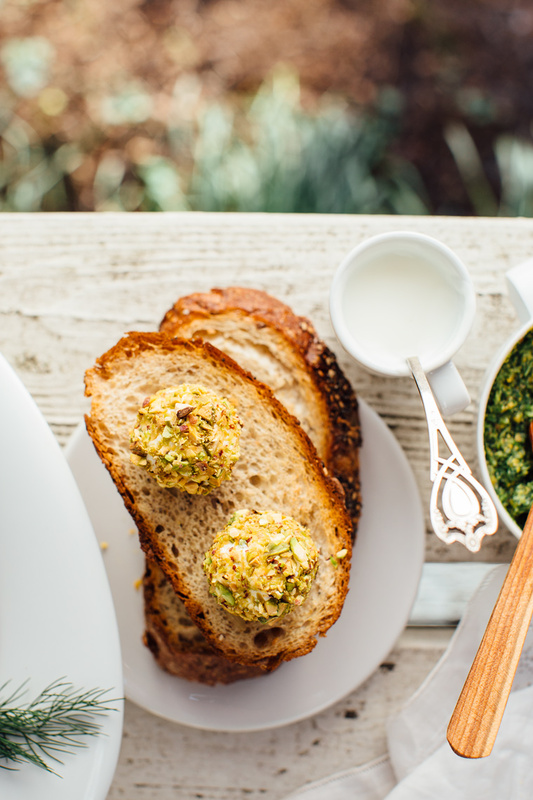 Using your hands roll up some balls and cover with crushed pistachios. 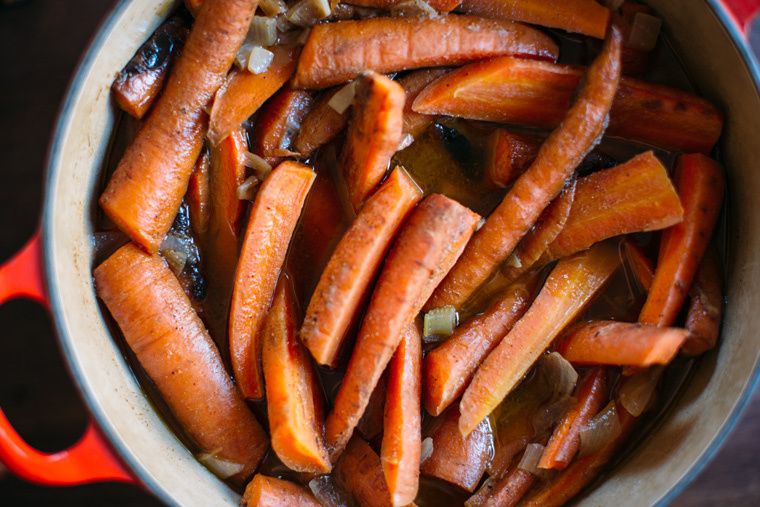 Trim and quarter the carrots, toss with spices, olive oil, minced shallot and teaspoon of salt. Roast at 400F for 15 to 20 minutes or until tender and roasty. 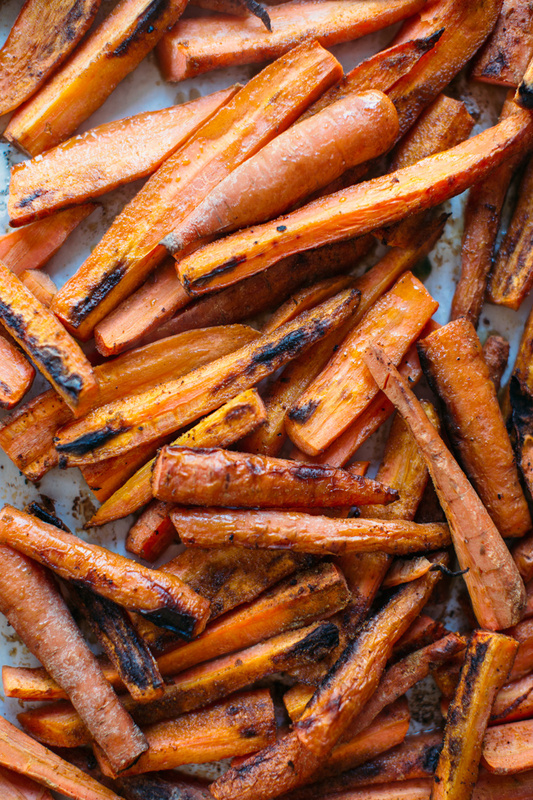 While the carrots are roasting make the pesto. Wash and dry the greens and place all ingredients except the oil into the food processor and blend. 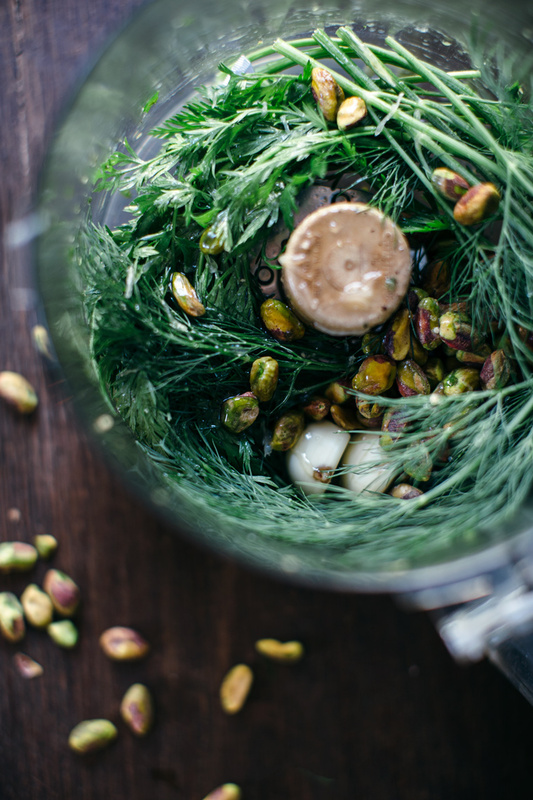 I find that if you add the oil after you process the herbs, nuts, etc you have a much nicer pesto consistency and flavor – less clumping + greater oil control. 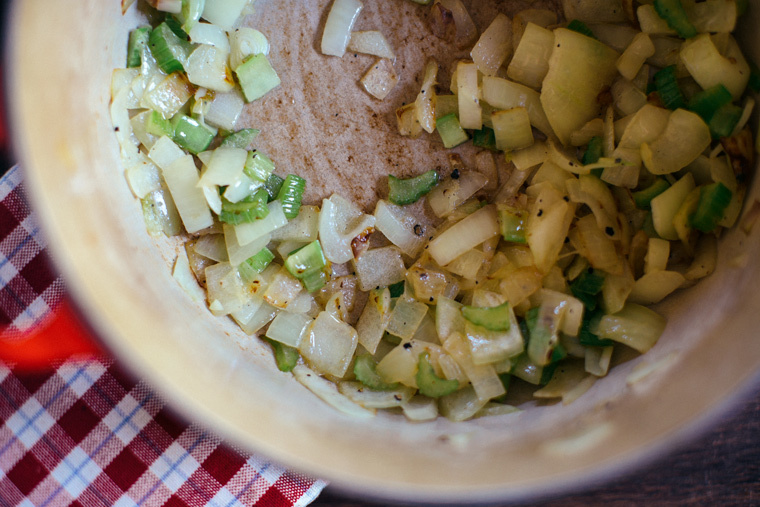 Begin the soup prep next – sauté a small onion and one celery rib in a bit of butter, earth balance or olive oil until tender and fragrant, add a few pinches of salt and some fresh pepper. Next, add the roasted carrots and veggie stock. Cover and let simmer 10 minutes or so or until carrots are really tender. Emulsify soup with you emersion blender or transfer to high-speed blender. 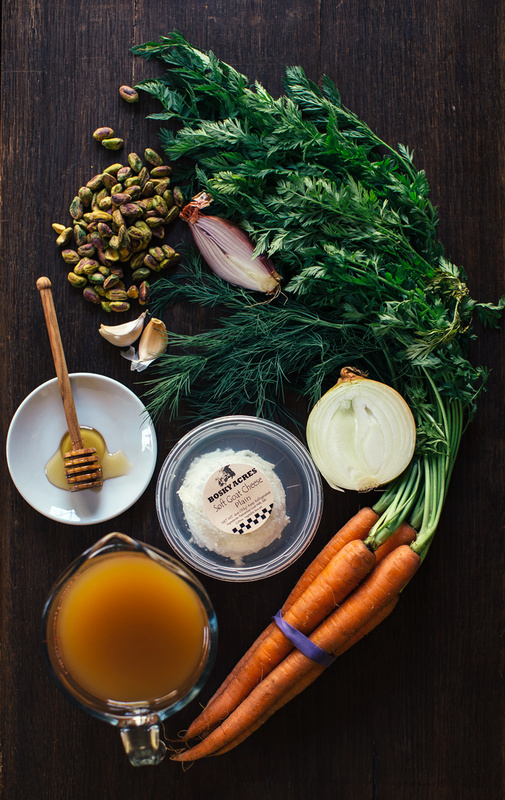 To make the goat cheese cream just mix the ingredients together adding more or less kefir for desired consistency. 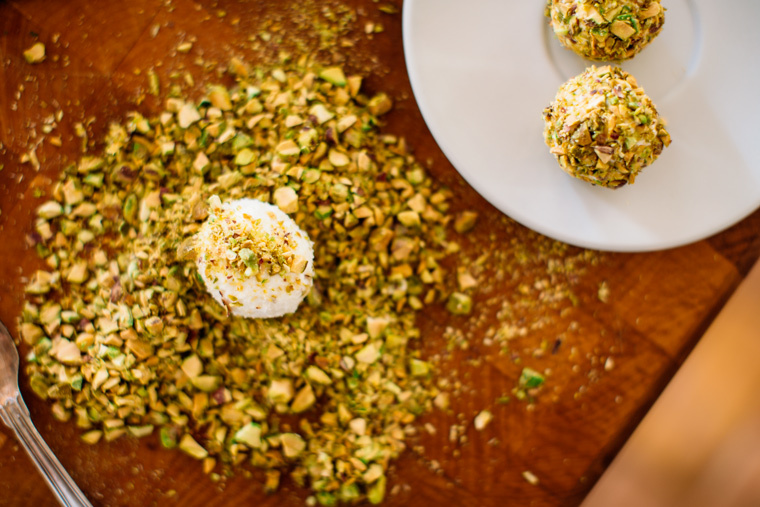 For the goat cheese truffles – mix goat cheese and honey together with a spoon, using your hands roll up some balls and cover with crushed pistachios. 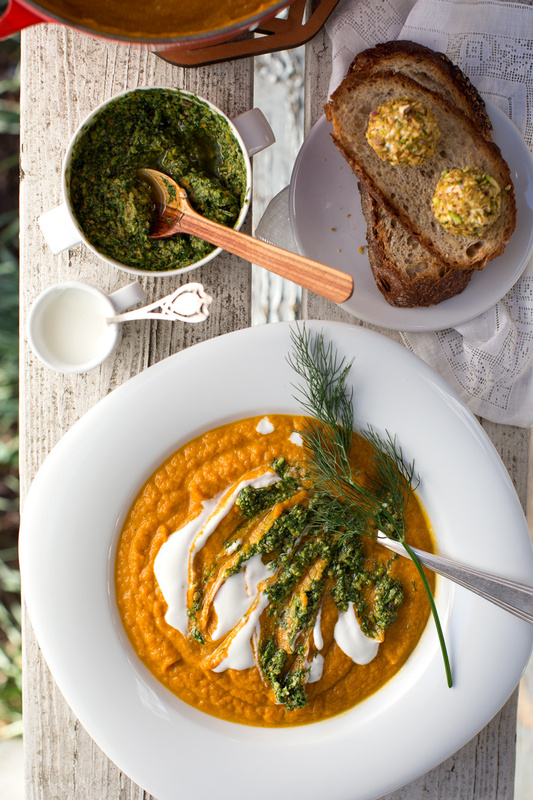 Serve soup with pesto and goat cheese cream swirls. This post was sponsored by Bosky Acres. All opinions are always my own. I loved this cheese and if you’re a goat cheese fan living in the Charlotte area you should totally check them out! 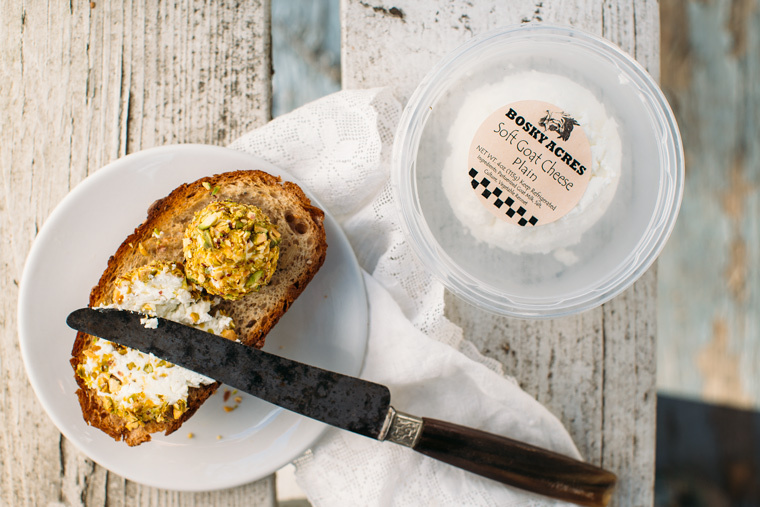 Here’s where you can find them: Bosky Acres Goat Cheese can be found at 4 local farmers markets (starting this weekend!) Charlotte Regional Farmers Market (Saturdays and Tuesdays), Matthews Community Farmers Market, Union County Farmers Market Monroe, Waxhaw Farmers Market, as well as Earthfare, Queen City Pantry and on the menu at many local farm-to-table restaurants like: Heritage Food & Drink in Waxhaw, Rocksalt, Fern and 300 East. Check out their Facebook page to see where they’ll be! Oh AND they’re building a cheese cave right now so they’ll be offering harder, aged cheeses really soon! Hanging out in a cool cheese cave sounds like a pretty fun summer activity if you ask me! Plus, aren’t baby goats the cutest?! This is seriously so beautiful! I’m with Jessie… way beautiful and holy crap, it sounds amazing. Wish I had a bowl of that right now! What a fun family weekend you had to celebrate your sister’s return! 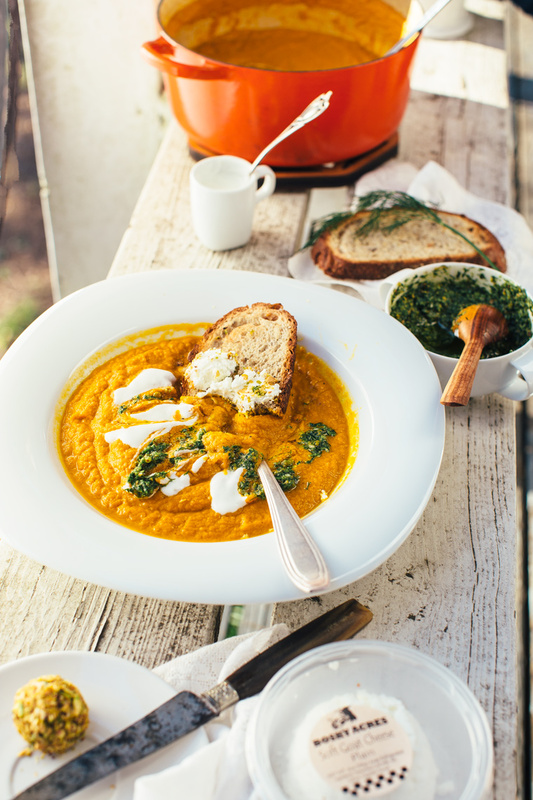 And this is an incredible looking soup that is sure to please veg and non veg eaters, alike. 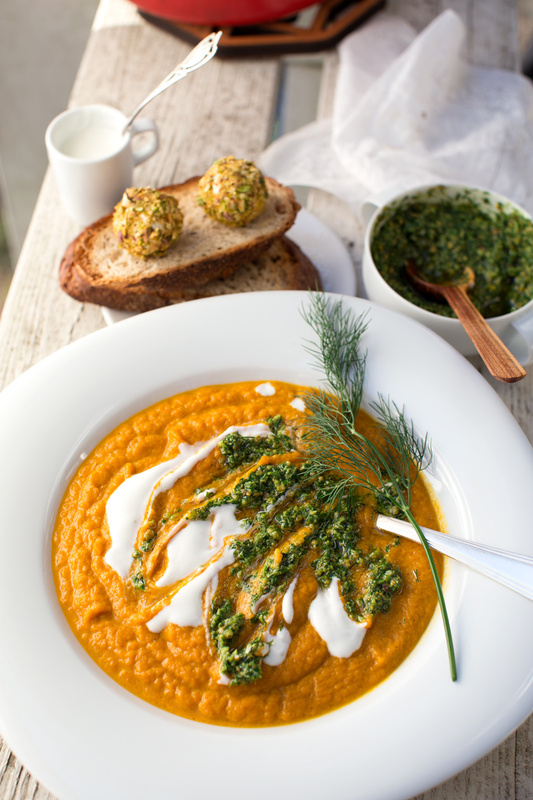 Love the carrot top pesto, Grace. What a gorgeous meal! 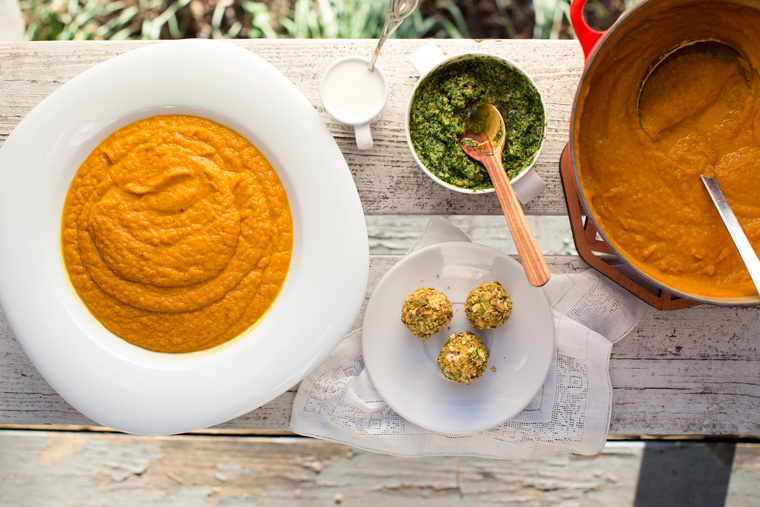 All of it – the soup, pesto and goat cheese truffles sound so, so amazing. This is just gorgeous, Grace. Like seriously stunning! Wow.